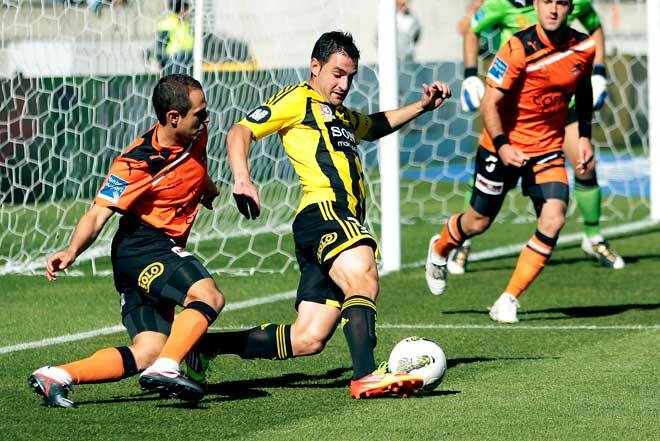 Straining to line up a shot on goal, Wellington Phoenix's Daniel Sanchez (in yellow shirt) is dogged by two members of the Brisbane Roar during an A-League match in Wellington in February 2012. Spanish-born Sanchez played professionally in his homeland and Scotland before signing with the Phoenix as striker. The A-League is Australasia's top professional association football league, and New Zealand has had a team in the league since its formation in 2005. A-League teams face limits on the numbers of non-Australasian players, and on player salaries.